When Will The United States Housing Market Rebound? Q: When will the housing market rebound? Let me state this up front - anybody who states with 100% confidence that they know exactly when the housing market is going to start to rebound is completely clueless. 1. When will the economy start to recover? 2. Will these newly introduced government programs (such as the $75 billion dollar foreclosure plan) help to stem the tide of foreclosures in the United States? 3. When will the fear that is gripping people's hearts start to dissipate? 4. When will people who are on the sidelines (and there are many) start to feel emboldened about buying again? 5. When will banks start lending again? 6. When will the unemployment numbers start to reverse and head lower? 7. When will people start to feel confident about the economy and their futures once again? There are all questions that need to be answered before we begin to talk about a recovery in the real estate market. A real recovery won't happen until the average American starts to feel more optimistic about the economy and their short-term futures. A real recovery won't happen until banks start opening up their pursestrings and lending again. A real recovery won't happen until the huge number of bank-owned properties start to disappear from their books. When will a recovery take place? Some people, such as Jim Cramer, expect that the real estate market will bottom in the summer of 2009. This seems a bit optimistic to me, considering that this is just 4-5 months away. I mean - unemployment numbers are spiking and there is serious talk that some of the nation's biggest banks might be nationalized. This doesn't sound to me like the ideal environment for a pronounced turnaround. We are at least a few years away from seeing a dramatic improvement in the US housing market. I'm of the opinion that we are currently in the midst of a multi-year depression. There are many things that need to be "fixed" before the housing market can put in a long-term bottom and start working its way higher. 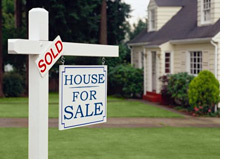 That being said - there are thousands of different real estate markets in the United States. There are some really good buys to be had RIGHT NOW, and some other markets that are still overpriced (in my opinion). But when it comes to speculating that the real estate market will trend higher (significantly) over the short-term - no thanks. I just don't see it.